Pale green pitchers about 12 to 18 inches tall. 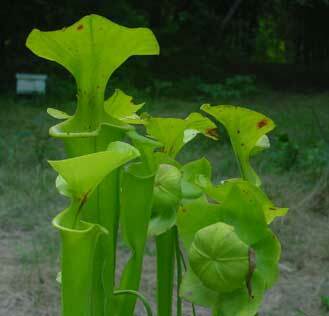 There isn’t much to distinguish this plant – except for the fact it is a pitcher plant and eats bugs! It can be hard to tell the difference between P. alata and P.rubra or P. alabamensis. The vertical veins on P. alata are basically vertical pinstripes while those on S.rubra and S. alabamensis have secondary veins connecting them. 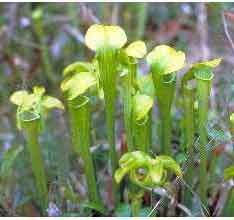 The flower of the Pale Pitcher plant is usually pale yellow or cream colored. I will try to get some pictures up next spring when they bloom.